LifeTime helps you to keep track of your health and ensures you get the best possible treatment. Your complete medical history always at your fingertips. For you, for your doctors and for your well-being. Increase patient satisfaction and workflow efficiency. 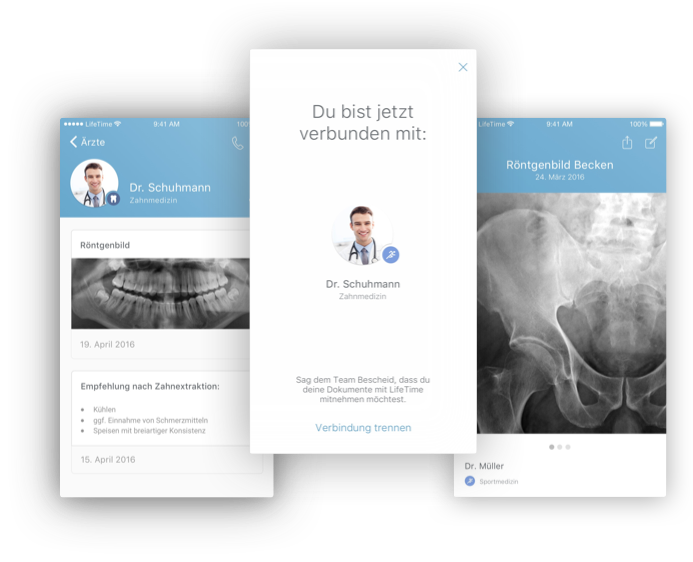 In your LifeTime App you store information like reports, x-rays and lab results that is created in the course of a doctor’s visit. Whenever visiting a doctor, you have all your documents at hand. With LifeTime you can instantly share all relevant information with your doctor. Exchange data with your doctor. With the LifeTime App doctors send medical documents directly to your smartphone – no matter if you're at the doctors office or not. Download the LifeTime App now and check it out even before your next doctor's visit. All data is only in your hand. LifeTime is an encrypted App, that can only be opened with your personal PIN or your fingerprint. Documents are being exchanged end-to-end encrypted with your doctor’s office. Certified data protection by ePrivacy. We are looking for a (Junior) Online Marketing Manager.